Well apart from the foolishness of the Easter pun I'm about to make, today has been a pretty good Friday. Having planned to leave for our camping trip early this morning, of course we didn't get on the road until around lunch time, after packing and picking up Frankie and Simon and everything. The drive to Chantal's parents' place went by surprisingly quick and because most of the day had already passed away and the sun was soon to set, we decided just to pitch our tents in the backyard in preparation for the real thing tomorrow. I'm looking forward to it, though the facilities here are awfully convenient. 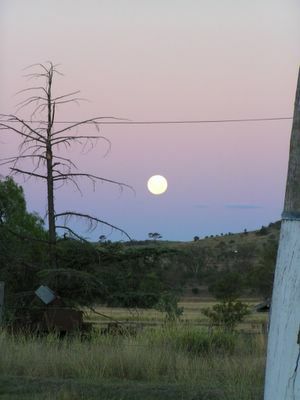 Until the sun had completely fallen behind the hills to the west, we played a little game of cricket, watching the full moon rise slowly into the eastern sky.